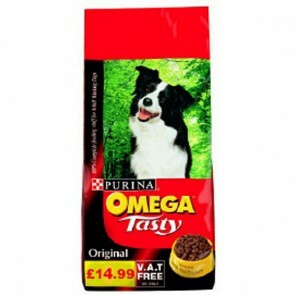 Purina has formulated a range of Omega Tasty Dog foods for each stage of your dog's Life, that are 100% Complete & Balanced and have been designed to provide your dog with the Correct Balance of Nutrients, Vitamins & Minerals to help keep them Fit, Active & Healthy. 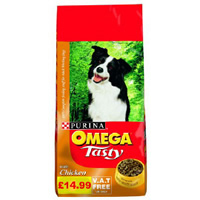 The Purina range also includes a Purina Omega Maintenace Dog Food, Specially formulated for Adult Working & Farm Dogs, which is VAT FREE and shown below on this page. Omega tasty dog: 5 stars out of 5 based on 1 user reviews.